Over a year ago, Canonical the maker of Ubuntu announced a plan to introduce a phone called ‘Ubuntu Edge’ which was supposed to act both as a smartphone and a desktop. They were planning to crowdsource it with a target of $32 million which they failed by a large margin. Although they made one of the biggest crowdsourced funds at that time, the hope of having a Ubuntu running phone vanished until canonical announced a partnership with Meizu and BQ, we are now able to see the result of that partnership. 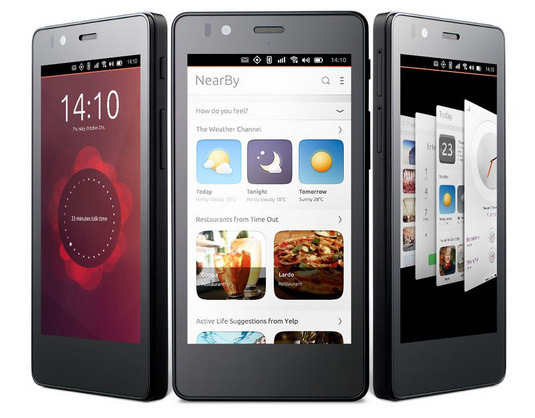 From next week, Canonical will sell their first phone called Aquaris E4.5 online. The phone will be sold in a pretty Xiaomi like flash sale manner. This means you will be seeing the phone coming and going for some time depending on the fact they have an adequate number of phones available to meet the demands. The phone is basically for the early adopters and for developers who wants to code apps hassle free. A new feature called Scopes is a new card like user interface which has similarities with Google Now. The home screen as well as all the screen will act like that. Each screen or scopes will act like its own personalized set of services providing weather forecast to news to anything you use in your everyday life. Other than the default scopes like music, videos, photos, nearby you can set your own scopes as well as let one service become a scope of itself. This user interface gives the user a fluid experience while giving the developers to think less about icons-apps and more on services they offer. The phone in question is basically made by not so familiar tablet and e-book maker BQ who already has a Android version of the phone as well. The phone comes with 1.3 Ghz Cortex A7 based Mediatek Processor, Mali 400 GPU, 1GB RAM and 8GB internal storage. The phone sports a 4.5 inch (540×960) display coming with a 2150mAh battery. For camera you get a 8MP rear and 5MP front camera and storing them are made easy thanks to the support of microSD card slot. The phone also supports dual sim. The phone will be on sale in Europe from next week for $195. While a new OS might sound intriguing the sheer price of the device takes us a back. There is also good quality devices in the very price range such as Moto G and devices from Microsoft Lumia. Also the fact that it doesn’t have much app support and service, the early adopters will find it hard to use it. Still let’s see if Canonical can pull it off this time with their ubuntu OS.